Sunder Deep Group of Institutions (SDGI) was established in 2004 with a vision of becoming center of excellence for professional education in all its realms. A group of noted academicians and eminent industrialists with high social acceptance had joined hands to establish SDGI. Within a short span of time, SDGI has assumed a credible position among most progressing professional education institutions of National Capital Region. 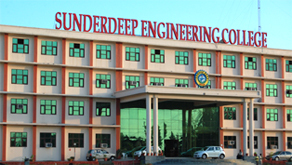 Campus: Sunder Deep Group of Institutions (SDGI) was established in 2004 with a vision of becoming center of excellence for professional education in all its realms. A group of noted academicians and eminent industrialists with high social acceptance had joined hands to establish SDGI. Within a short span of time, SDGI has assumed a credible position among most progressing professional education institutions of National Capital Region. This exponential growth itself is a testimony of sincere efforts being put in by faculty and staff members of SDGI. SDGI is ably supported by a well-equipped campus enabling barrier free education to streams like engineering, management, pharmacy, architecture and hotel management. This campus is spread across 40 acres of lush green land offering most picturesque view with soothing effect. Moreover, its distance from hustle and bustle of city also creates perfect ambience for smooth growth of professional education. Central library: An enriched library with latest books, journals, magazines and periodicals is the centre of attraction for students. This fully automated library presently houses more than 50000 latest reference titles on technical, management and related subjects as well as 60 national/international journals helps the students and faculty to keep abreast with the latest developments. The different sections of library have been fully automated through e-institute management system. The online web journal facility is also used to provide access to abstracts and full text versions of major national and international journals in the field of engineering, medicine, hospitality, architecture and information technology. Live video lectures are also delivered by eminent professors from the world-class institutions to students and faculty members.